In the month of August, Khaghogh Orhnek or the Blessing of the Grapes service is conducted in the Armenian Church as part of the celebration of the Feast of the Assumption of the Holy Mother of God (Soorp Asdvadzadzin). The blessing of the grapes traces its origins back to the Old Testament, to the time when the first produce of harvest (“first fruits”) was the grape. It later took on a new meaning, representing Jesus Christ, the first born and the “first fruit” of Mary. As a choir member at the Armenian Church of Holy Martyrs, I celebrate Soorp Asdvadzadzin by singing special chants (sharagans) and observing the blessing of the grapes. When the grapes are blessed, each person receives a cluster, in order to feel blessed themselves, as well as refreshed. Recently, I read a book called The Secret Life of Bees by Sue Monk Kidd, where the protagonist saw Mary as a warrior fighting with her robust strength and ferocious figure, but also looked at Mary with her feminine beauty and warmth. The latter part reminded me of the church altar, where Mary is depicted with her son Jesus Christ, holding him with a magical touch. The depiction of Saint Mary with the Son of God and a bundle of (symbolic) grapes. 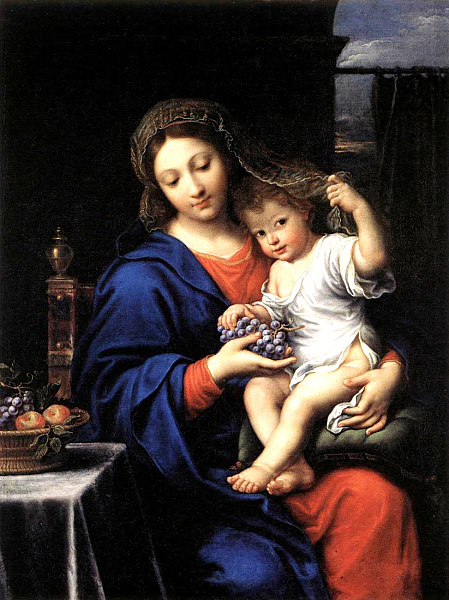 The Virgin of the Grapes Pierre I. Mignard (1612-1695).